Canadians like me are getting ready for the 150th anniversary of Canada's founding on July 1! 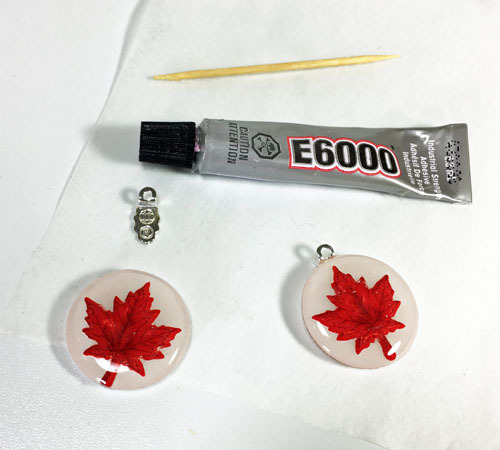 So I thought I would make myself some easy maple leaf jewelry ready to wear for that day. 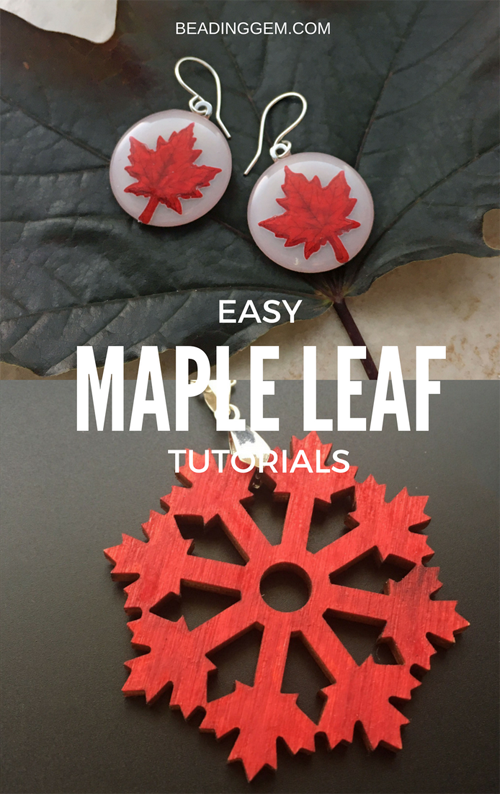 You don't have to be Canadian to use this tutorial as you can use any sticker - not just leaves and any laser cut wood pendants. 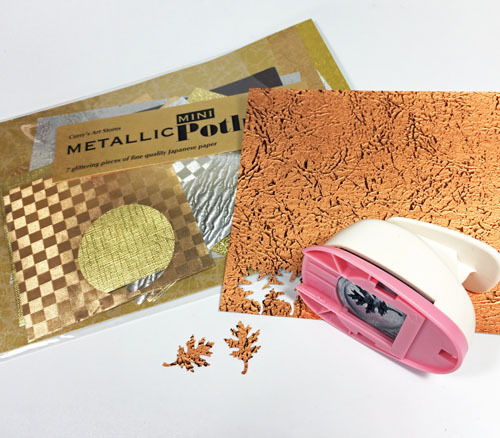 You can easily get stickers from any craft store. 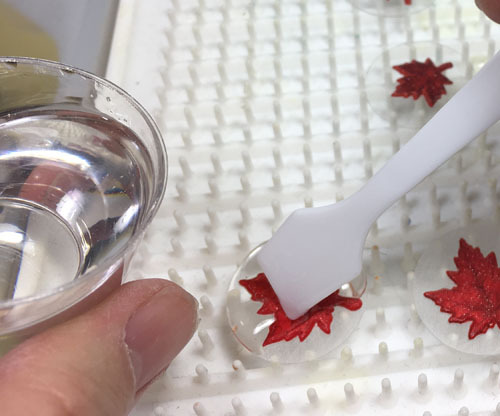 I picked up a set of maple leaf ones. The first thing is to cut out or use a punch to create the base for the stickers. You can recycle plastic containers but I found that when I tried to use a punch, the cut out was not cleanly made. So you may have to draw a circle and cut it out with scissors. I prefer to punch out shrink plastic which is not as hard. The stickers are simply stuck onto the prepared plastic backings. You can also use a leaf punch. I punched out some lovely metallic paper. If you use regular paper or card stock, you need to use some spray varnish to protect the paper. Resin makes paper or card stock go translucent. 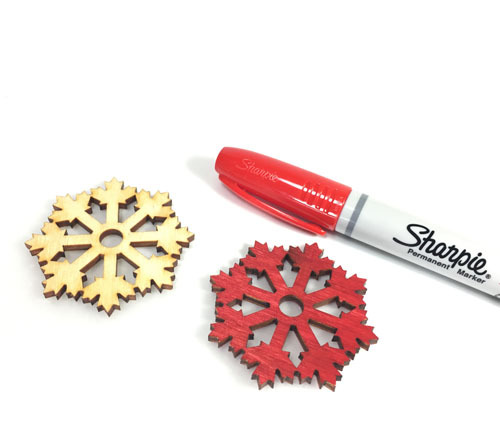 As these cut outs are not stickers, you will need a little glue to attach them to the punched (or cut) plastic backings. My favorite go to resin is Little Windows' Brilliant Resin (Use this discount code : BG1516 for 15% off.) 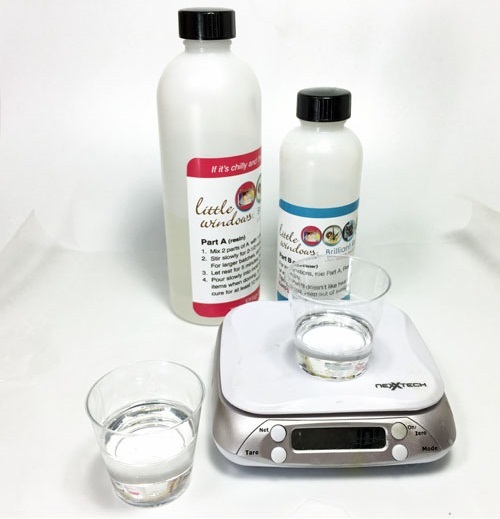 This is a doming resin which is clear and has a longer shelf life than other common brands. Rather than squint and look at cup markings, I prefer to just weigh out each part. This particular resin is 2:1 ratio whereas many resins out there are 1:1. 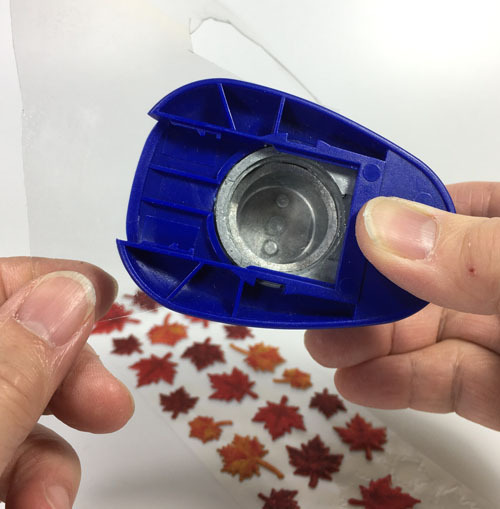 Once both parts are mixed according to the instructions, it is time to carefully add some to the stuck on leafs and the plastic backing. I placed the items on a silicone doming tray which I bought from Little Windows. 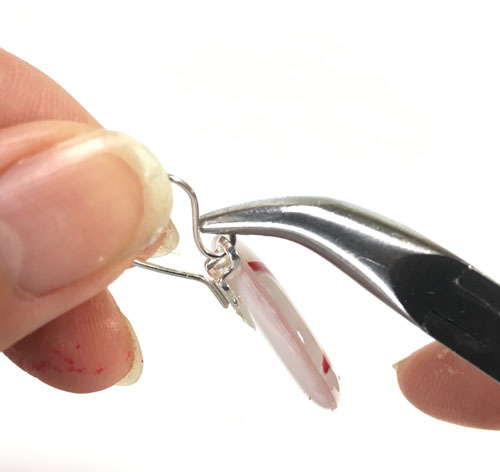 (Any resin spills can be easily peeled off once they have dried.) Use a toothpick to coax bubbles to the surface. Make sure you cover the whole tray during the 24 hours it takes for the resin to cure otherwise dust specks might settle on the work. Once dried, make up more resin and color it with either a little white oil paint or a proper resin colorant. I used Little Resin's white colorant. Dome the back of the resin pieces. I decided not to drill holes but to glue on some small earring bails. Then it is a matter of just adding the ear wires! 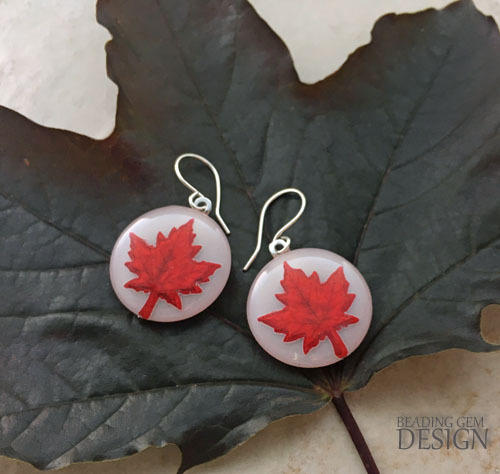 Maple leaf earrings on a real maple leaf! This leaf comes from the red maple in my garden! 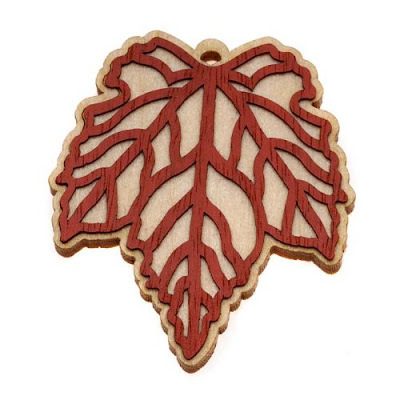 I also picked up some laser cut wood pendants with maple leafs around the perimeter. I got them from Stockade, an online and retail craft supply store in Guelph, Ontario. I simply colored them red on both sides with a marker pen. You can also use spray paint or acrylic paint pens. 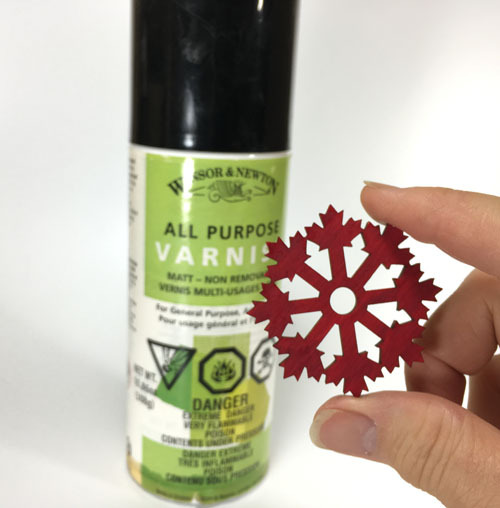 It is a good idea to spray varnish the pendant a few times. I used a matte varnish. Again, rather then drilling holes, I just added a pinch bail to one of the gaps in the pendant! 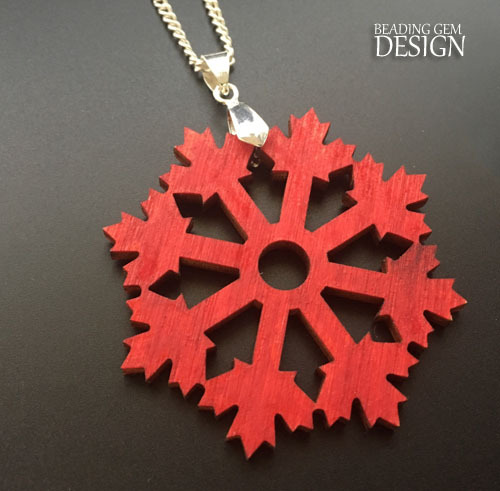 You may also like this wonderful maple leaf from Laser Expressions which has a red stained cutout. Attaching it to a simple leather cord or a more elaborate beaded or kumihimo cord are a couple of options to consider. 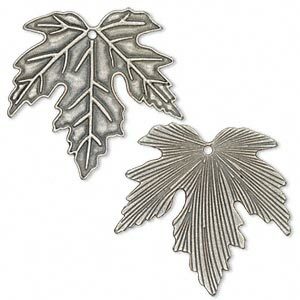 Or if metal is preferred, there are all kinds of maple leaf charms, both small and big. Consider coloring some of the metal ones such as this zinc allow large pendant below. 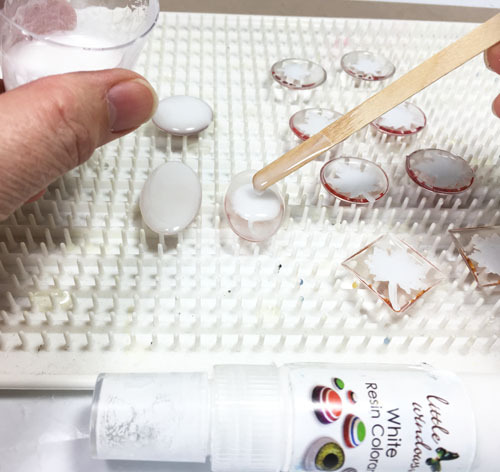 Using the white resin colourant to apply to the back of your resin projects....great idea! I must admit I was rather smug that I did think to make my own. Apparently lots of people have been asking Iguana Beads where I teach for maple leaf charms! Congratulations for the upcoming celebration! You are lucky that maple leaves are so beautiful! Love the jewelry - the earrings are so cool! We are all pumped up for Canada's 150th! !